BlackOut recently designed and launched three websites, a blog and a wiki for the Institutue for Public Policy and Economic Development, helping to bring online the Institute’s reputation as the most comprehensive resource for housing information in Northeastern Pennsylvania. 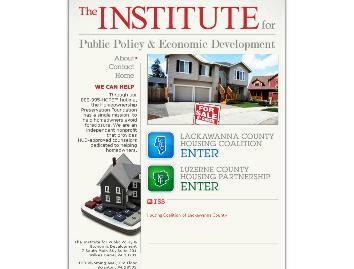 The project included an Institute for Public Policy and Economic Development portal page with information on the goals and history of the organization. From the portal page, users can find more detailed housing information by following links to the Lackawanna County Housing Coalition site or the Luzerne County Housing Partnership site. Each county-specific site features a wealth of information on buying, selling, building or refinancing a home, as well as resources for contractors and developers. BlackOut allowed the Institute to further extend the reach of its message with a wiki and a blog to open a dialogue with homeowners and potential homeowners in Northeastern Pennsylvania.